Children typically have eight primary, or baby, molar teeth -- the first and second molars, two on each side of the upper and lower jaws. The average age for loss of these primary molars is 10 to 12 years, with children having at least all of their first and second permanent, or adult, molars by the age of 13 to 15 years of age. As with most health care guidelines, however, there is a broad range of what is considered normal where these ages are concerned. The main reason the primary molars fall out is nature. At the appropriate age, these "starter teeth" will fall out on their own to make way for the permanent teeth that will take their place. Primary teeth begin to loosen and fall out as their roots dissolve away. This is completely normal and not a cause for concern. But molar loss can also occur for other reasons. For example, the molar or molars might never have come in, an indication of a congenitally absent tooth. The teeth might have been badly destroyed by decay, falling out or requiring a dentist to extract them. Traumatic tooth loss can also occur in children and is usually a result of contact sports. Such loss is easily prevented by the use of mouth guards, fitted by a dentist, and by wearing safety gear. 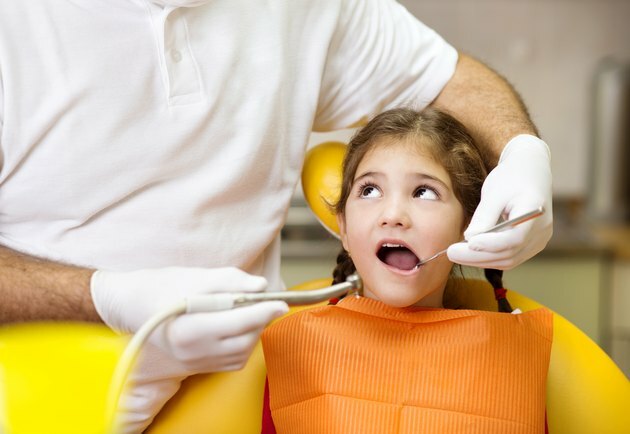 A number of issues can occur when children lose their molars too early or too late. When baby teeth are lost early, for instance, they can no longer act as guides for the adult teeth that are coming in, causing problems in bite and appearance. On the other hand, when the baby molars are lost very late, or not at all, the adult teeth cannot come in and are retained within the jaws. In some cases of retained baby molars, the adult teeth will manage to force their way in, though they will often settle into improper positions in the mouth. Any of these circumstances can cause problems that will need to be addressed by a dental professional. Depending on the age of the child, there are several treatment options for abnormal loss of molar teeth. Options include removable or fixed appliances that a dentist can place in the mouth. Orthodontic or surgical treatments might also be considered if the bite requires correction. The choice of treatment depends on the age of the child, mental and physical abilities and development, and various other factors which the dentist will discuss with the child and parents. Any tooth loss due to trauma requires prompt emergency dental care. As soon as possible, carefully rinse the lost tooth in a bowl of tap water, not in running water. Try placing the tooth back in your child's socket and having him bite down gently on gauze to hold it in place. Keep the tooth in place until your child can see a dentist, which he should do without delay. If it is not possible to replace the tooth in the socket, bring the tooth -- in milk, the child's own saliva or a mild salt solution -- and your child to a health care professional. Be careful to handle the tooth only at the top part, the crown, and not by the roots. As the baby molars fall out, adult molars are just under the gums, pushing their way in. This causes teething pain until the adult tooth is fully in place. The pain can be very uncomfortable and the gums may appear swollen. Mild painkillers like acetaminophen or ibuprofen, ice packs, topical analgesics, and gently massaging the gums around the area may help. Parents should be careful to see that the child does not choke on or swallow the tooth that is lost. This is especially important if the tooth is lost at a very early age. The child may find it difficult to eat or chew when there are loose teeth in the mouth that are waiting to fall out or when the adult teeth are coming in. During this time, prepare very soft foods, soups or purees to enable your child to continue eating normal amounts of all food groups. Ensure that the child continues to maintain good oral hygiene with brushing and flossing, even though this can be uncomfortable at this stage. If you have any doubt about whether your child is experiencing normal tooth loss or a dental infection, contact your dentist for advice.